Lou is currently working on stepping into public and keynote speaking. He gives some of his insights on breaking into this market. • Tells about his topic, The Magic of Communication or How to Command the Attention of an Audience, and how he decided upon that topic. • Talks about some of the lessons he’s learned so far in this journey. • Tells how he connects a topic points to a magical effects and gives an example. A $9,000 infomercial that ultimately flopped. It yielded absolutely no results. Find out what he learned. Releasing his Steel Ball Routine which sold like hot cakes and ultimately helped him get through The Great Recession. How does he differentiate himself? Lou differentiates himself from others in his genre by how he performs and how he does business. He ultimately wats his clients to get the best, even if that means he needs to hire someone else to fill their needs. Yes. He “made it” the moment he started moving toward his goal of becoming a professional magician. Keeping a database of clients & prospects and keeping in touch with them. Is there anything he would have done differently up to this point? He would have been wiser with money early on. He wouldn’t have been as careless with it as he had been at the beginning. • Lou brings us into his incredible journey of finding himself in music, then in magic, and how he’d actually hit rock bottom, finding himself without any real marketable skills and having to get a job driving that paid $5 an hour at the time. Find out how he got out and was able to transition into performing full time. • The importance of having a list of clients and prospects and keeping in touch with them. • How the Magic Castle has helped him in his career. • Tells about why he gives a 20% commission to people that refer him shows and how effective it has been for him. Treat your art as a business if you want to be successful. It’s never too late to start. Special Offer for Successful Performercast Listeners ONLY! 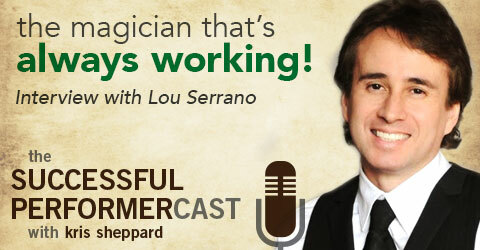 Lou is offering 20% off of his marketing course for magicians. This is a great course. It’s what got me to take the first steps in marketing my magic business and has helped me tremendously. Visit www.sixfiguremagic.com and use the coupon code KRIS at the time of purchase and you’ll automatically get 20% off! Where can we find Lou Serrano?